Fresh and simple, this recipe is sure to please. 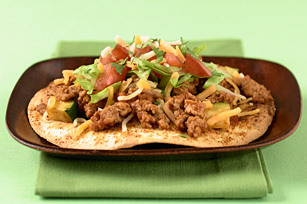 Ground turkey, zucchini, tomatoes and creamy cheese over a crunchy tortilla, yum! This is a great Mexican recipe. Place tortillas in single layer on baking sheet; spray with cooking spray. Sprinkle evenly with 1 tsp. taco seasoning mix. Bake 6 min. or until tortillas are crisp and lightly browned. Meanwhile, cook turkey in large skillet sprayed with cooking spray on medium-high heat 4 min. or until done, stirring frequently. Add zucchini, salsa, water and remaining seasoning mix; simmer 5 min., stirring occasionally. Spoon turkey mixture onto tortillas; top with cheese, lettuce, tomatoes and cilantro. Store any leftover turkey mixture in airtight container in refrigerator. Store any leftover tortillas in airtight container at room temperature. When ready to serve, spoon turkey mixture onto tortillas; sprinkle with cheese. Heat in toaster oven or microwave. Continue as directed. For added kick, top tostadas with thin fresh jalapeño slices before serving.